Needlework as Art: Online Book Worth a Look! 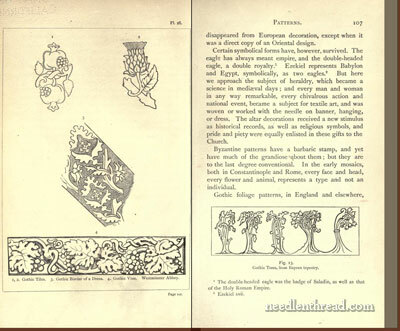 Needlework as Art, by Lady Marianne Alford and published in 1886, is definitely worth a look – and, if you’re a Lover of Old Needlework Books, it’s worth reading. 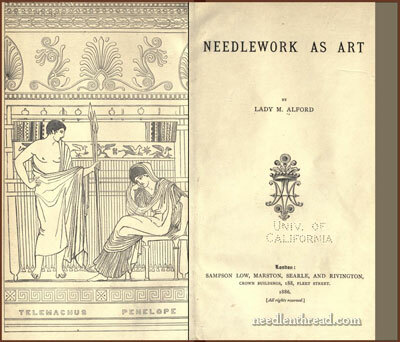 The beginning of the book features an overview of the history of needlework from the ancient world forward. It is not an in-depth, super-detailed history (who could fit an in-depth, super-detailed history of needlework into a quarter of a book? ), but it is just enough of a detailed survey to put needlework in perspective historically. The book has extensive chapters on patterns and materials as well. I like the line drawings throughout the book – several of them are just begging to be adapted and stitched. I’ve got my eye on a couple that might make interesting beetle wing embroidery projects, of all things. You can download Needlework as Art as a PDF straight from Internet Archives, or you can read Needlework as Art directly online. However you decide to read it, or even if you just want to browse for pictures (hey – I do that all the time! ), I hope you enjoy it! Thought I would pass this along, as I was really impressed all ways around. Hi Mary, thank you for the link. I also wanted to say that I sent you an email last week, but I think it may have gone to your spam folder as I have a yahoo address. Thank you for the link to the book. I downloaded it to my Kindle, now I have something needlework related to read in waiting rooms. Hi Mary, thanks for the link! I willdownload this presently! it’s the most amazing source of inspiration I ever found. There are motives in all possible sizes and styles, not the usual “childish” stencil stuff, but truely accomplished designs. They all of course have a slightly stylized look because of the medium, which makes them very stitchable! I am not payed to make them publicity, I am just a very happy customer who loves their stuff. Thanks for the link, Katy! I have visited the stencil library before and have it in my “favorites” – but it’s been a while since I’ve stopped in there! So thanks very much for the reminder! !